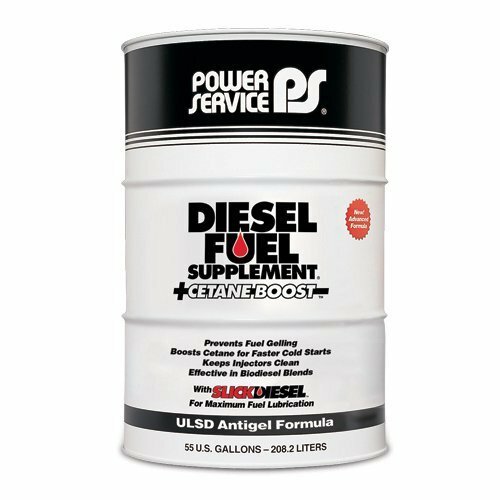 Power Servivce Diesel Fuel Supplement +Cetane Boost is an antigel/winterizer that is used in the cold winter months to keep fuel-filters from plugging with wax and to prevent fuel gelling. This Arctic Formula effectively treats all diesel fuels to keep equipment running trouble-free for maximum winter operability. Power Service Diesel Fuel Supplement is intended for use only during cold winter months when temperatures drop below + 30°F. Use Diesel Kleen +Cetane Boost (in the silver bottle) for peak performance in non-winter months. If your vehicle will not start or gain power in cold temperatures, use Diesel 911 (in the red bottle) as directed on the container label. Equals performance of a 50/50 blend of No. 2 and No. 1 diesel fuels. Lowers Cold-Filter Plugging Point (CFPP) as much as 36°F. Keeps fuel-filters from plugging. For all diesel fuels, Ultra Low Sulfur Diesel (ULSD) and blends containing up to 20% biodiesel (B20).